Mystery Photo: Who is this Unknown Woman with My Great Grandmother? There are very few photographs of my great grandmother, Margaret (Jones) Jackson aka Marguerite Jackson. I believe I have five total. That is what makes this photograph so intriguing. My great grandmother is on the left, my mom is the child, then there is the unknown woman on the right. My mom is about 5 years old, so the photo was taken ca. 1939. It was most likely in Oakland, California where my mom lived or San Francisco where her grandmother lived. 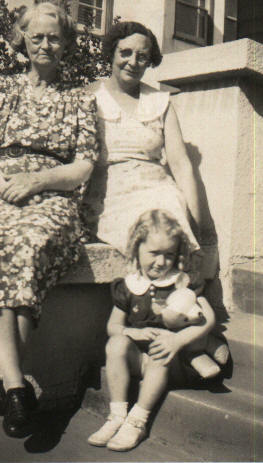 Who is this woman sitting with my mom and her grandmother, Margaret (Jones) Jackson? It appears this was taken on some sort of special day or family get-together. I have five other photos from this day. The others show my grandmother and grandfather and my grandmother’s sister, Julie. This photograph has bothered me ever since I found my grandma’s satchel. It was one of a hundred or so old photographs she managed to save from before her divorce in 1949. I don’t have any photos of my great grandmother’s sisters, Josephine Pohley, Alice Bourne, and Gertrude Burke. All three were alive at the time. I know that Margaret and Gertrude kept in touch. Could this woman be one of Margaret’s sister? Or, is she a neighbor who just happened to be in a very nice photograph of grandmother and granddaughter left behind to taunt me? Using Google Picasa, I was able to enlarge the photo for a closer look. Do these two women look related? 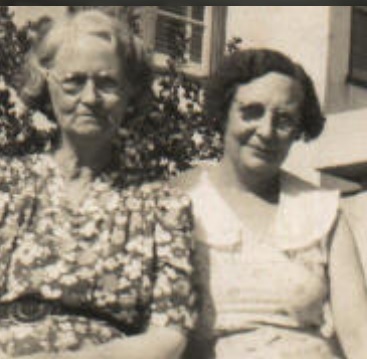 Who is the woman on the right next to my great grandmother? I’m hoping someone will find this blog post, see this woman, and recognize this woman. Do you know who this woman? If so, please tell me! I would love to put a name to the face. Photographs can tell us so much about our family history. It is truly a blessing to have photographs of our ancestors and relatives. I totally think these two women are related as it looks like all their features are so similar. Could you date the clothing of the family to get a closer photo date ? Do you know the ages of the sisters ? The mystery woman looks to be younger. Gail, I believe there is a resemblance, too, but I think I am biased because that’s the conclusion I would like to see. Given my mom’s age, the photo was taken between 1940-1941. Yes, I do know the ages of the sisters. The order was Josephine, Margaret, Gertrude, then Alice. Gertrude was 2 years younger than Margaret but Alice was 6 years younger. My guess based on age would be that it is Alice.